Manufacturing activity continued to expand solidly, even with the Institute for Supply Management’s Manufacturing Purchasing Managers’ Index edging down from 59.3 in December to 59.1 in January. New orders increased at their fastest pace in 13 years in December, but that expansion slowed a little in January, down from 67.4 to 65.4. Nonetheless, it was the eighth consecutive month that the sales measure exceeded 60, which would signify robust growth in demand overall. International growth helped fuel that demand, with exports (up from 57.6 to 59.8) expanding at their best pace since April 2011. Respondents in the sample comments tended to echo that finding, citing a brightened outlook and stronger U.S. and global sales growth. Among other things, tax reform and other pro-growth measures have helped boost confidence among business leaders in the sector. Other data on manufacturing activity were also encouraging. For instance, new factory orders rose by 1.7 percent in December. For durable goods firms, much of the increase stemmed from sharply higher sales of defense and nondefense aircraft and parts, which can be highly volatile from month to month. Excluding transportation equipment, new orders of manufactured goods were up 0.7 percent in December. Overall, new factory orders—which struggled in 2015 and 2016—trended in the right direction in 2017. Indeed, sales of manufactured goods soared 8.4 percent since December 2016, or 6.6 percent with transportation equipment sales excluded. At the same time, the Dallas Federal Reserve Bank’s composite index of general business conditions expanded in January at its fastest rate since December 2005, with the Texas economy continuing to rebound with robust growth and a very positive outlook for the next six months. On the labor front, manufacturers added 15,000 workers in January, extending the strong hiring gains in the sector seen throughout much of 2017. Manufacturing employment rose by 15,750 workers per month on average in 2017—quite a turnaround from the sluggish job growth experienced in 2016. Business leaders have told us that recruiting new workers is their primary business concern right now. Along those lines, average weekly earnings for production and nonsupervisory employees in manufacturing have risen 2.8 percent over the past 12 months. Since the end of the Great Recession, manufacturing employment has risen by 1,102,000 workers, with 12.55 million employees in the sector in this report. That number represents the highest level of manufacturing employment since January 2009. In terms of the larger economy, nonfarm payrolls were up by 200,000 workers in January, or slightly higher than the consensus estimate of around 180,000. On average in 2017, the U.S. economy added 181,083 workers on net each month. The unemployment rate was unchanged at 4.1 percent for the fourth straight month, continuing to be its lowest level since December 2000. Nonetheless, the latest consumer confidence data were mixed. The Conference Board’s measure of consumer sentiment ticked higher in January and remained not far from the 17-year high recorded in November, boosted by improved perceptions about opportunities in the job market. In contrast, the University of Michigan and Thomson Reuters reported that confidence pulled slightly lower—while remaining quite elevated—in January. Although respondents were more upbeat about rising stock prices and their incomes, they were also uncertain about the impact of tax reform and anticipated that prices would pick up in the coming months. For their part, Americans have continued opening their pocketbooks, making personal consumption expenditures one of the bright spots in the U.S. economy. Personal spending was up 0.4 percent in December, with a rather robust 4.6 percent growth year-over-year. In addition, the savings rate fell to its lowest rate since September 2005, down to 2.4 percent in December. The savings rate has trended lower since peaking at 4.1 percent in February. It is yet another illustration that Americans have accelerated their purchasing—something that helped increase holiday spending and provide a significant boost to real GDP growth in the fourth quarter. After a few busy weeks featuring releases of numerous economic data reports, this week will see just a handful of releases, including updates on consumer credit, international trade and job openings. In addition, the NAM will publish its Global Manufacturing Economic Update on Thursday. ADP reported that manufacturers added 12,000 workers in January, extending the strong job gains in the sector seen last year. It was the eighth straight month of employment growth. Manufacturing business leaders have hired at a robust rate over the course of the past year, with the labor market tightening on improved economic outlook and healthy growth in activity. The sector has hired an average of 18,290 workers per month in 2017—a significant turnaround from 2016’s more sluggish pace. We expect continued strength in job growth moving forward. Meanwhile, total nonfarm private employment increased by 234,000 in January, easing just slightly from the gain of 242,000 workers seen in December. Nonfarm private payrolls rose by 212,794 per month on average in 2017, up from the monthly average of 180,892 in 2016. In January, the largest employment growth included trade, transportation and utilities (up 51,000), education and health services (up 47,000), leisure and hospitality (up 46,000), professional and business services (up 46,000), financial activities (up 16,000) and construction (up 9,000). Small and medium-sized businesses (i.e., those with less than 500 employees) accounted for 63.7 percent of the net job growth for the month. The Bureau of Labor Statistics reported that manufacturers added 15,000 workers in January, extending the strong hiring gains in the sector seen throughout much of 2017. Manufacturing employment rose by 15,750 workers per month on average in 2017—quite a turnaround from the sluggish job growth experienced in 2016. This growth is a sign that firms have continued to accelerate their hiring as the economic outlook has strengthened and demand and production have improved considerably. Indeed, manufacturers have told us that recruiting new workers is their primary business concern right now. Along those lines, average weekly earnings for production and nonsupervisory employees in manufacturing edged up from $884.87 in December to $888.63 in January. That translated into 2.8 percent growth over the past 12 months, which was encouraging. Since the end of the Great Recession, manufacturing employment has risen by 1,102,000 workers, with 12.55 million employees in the sector in this report. That number represents the highest level of manufacturing employment since January 2009. Overall, nonfarm payrolls were up by 200,000 workers in January, or slightly higher than the consensus estimate of around 180,000. On average in 2017, the U.S. economy added 181,083 workers on net each month. For comparison purposes, average weekly earnings in the private sector for production and nonsupervisory employees was $750.62 in January, up 2.4 percent from one year ago. Meanwhile, the unemployment rate was unchanged at 4.1 percent for the fourth straight month, continuing to be its lowest level since December 2000. In January, durable goods manufacturers added another 18,000 workers on net, but employment at nondurable goods firms was off by 3,000. The largest increases were in transportation equipment (up 5,700), machinery (up 5,400), fabricated metal products (up 3,100), miscellaneous nondurable goods manufacturing (up 2,400), nonmetallic mineral products (up 1,900), computer and electronic products (up 1,300) and wood products (up 1,300), among others. In contrast, employment declined in January in paper and paper products (down 2,200), printing and related support activities (down 1,700), chemicals (down 1,500), furniture and related products (down 1,300), primary metals (down 900) and petroleum and coal products (down 500). The Conference Board reported that consumer sentiment ticked higher in January, beginning the new year with renewed confidence in the economic outlook. The Consumer Confidence Index rose from 123.1 in December to 125.4 in January. The headline index remained close to November’s level (128.6), which was the best reading since December 2000. Americans were more upbeat in their views of the future (up from 100.8 to 105.5) even as their perceptions about current conditions dipped slightly (down from 156.5 to 155.3). As usual, pocketbook issues matter for respondents. 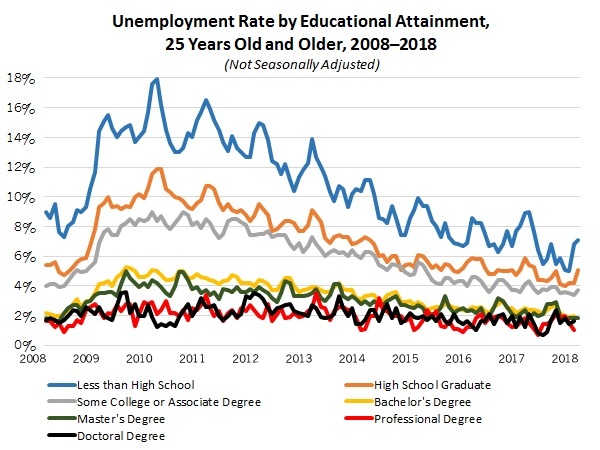 The percentage of those completing the survey suggesting that jobs were “plentiful” jumped from 36.3 percent to 37.6 percent, the strongest labor market reading in 16 years. Along those lines, the percentage saying that jobs were “hard to get” fell from 18.7 percent six months ago to 16.4 percent in this report, even though it ticked up from 16.0 percent in the prior release. In a similar way, the percentage of respondents expecting their incomes to decrease over the coming months declined from 9.0 percent in December to 7.7 percent in January. Just over 20 percent predicted higher incomes. The Census Bureau reported that private manufacturing construction spending pulled back once again in December, down 0.5 percent. The value of construction put in place in the sector declined from $60.87 billion in November to $60.60 billion in December, its lowest level since September 2014. Construction spending in the sector averaged $65.55 billion in 2017, down from the average of $74.61 billion in 2016. On a year-over-year basis, manufacturing construction dropped 11.7 percent. Indeed, activity has trended lower since achieving the all-time high of $82.13 billion in May 2015. Nonetheless, we would continue to expect a turnaround in construction activity in 2018, especially in light of the brighter manufacturing economic outlook. Overall, private nonresidential construction spending increased by 1.1 percent in December to its best reading since June, but activity was down 2.5 percent over the past 12 months. In the latest figures, the data were mostly higher for the month. More dollars were spent on construction projects in the office (up 4.2 percent), educational (up 4.1 percent), amusement and recreation (up 2.4 percent), religious (up 2.3 percent), commercial (up 1.6 percent), communication (up 1.4 percent) and lodging (up 0.9 percent) segments, among others. In addition to reduced manufacturing construction spending, activity was also lower in the power sector, which was down 0.5 percent in December, or 10.8 percent year-over-year. In terms of the fastest growth in 2017, the following categories had the largest year-over-year gains in private nonresidential construction spending in December: transportation (up 36.0 percent), commercial (up 5.1 percent), health care (up 4.6 percent), communication (up 2.9 percent), amusement and recreation (up 2.6 percent) and educational (up 1.1 percent). Meanwhile, private residential construction spending was up 0.5 percent in December, with a healthy 6.2 percent year-over-year gain. More importantly, private residential construction spending was $526.13 billion in December, its best reading since March 2007. In December, single-family and multifamily construction rates were up 0.4 percent and 2.6 percent, respectively, with growth of 8.7 percent and 4.6 percent since December 2016. In addition to those components, public construction spending rose 0.3 percent in December, with a gain of 4.4 percent over the past year. The Dallas Federal Reserve Bank reported that manufacturing activity expanded in January at its fastest rate since December 2005, with the Texas economy continuing to rebound with robust growth. The composite index of general business conditions increased from 29.7 in December to 33.4 in January. While the underlying data remained encouraging, they were also quite mixed. Growth in shipments (up from 21.5 to 27.1) and capital expenditures (up from 19.0 to 20.0) accelerated in January. However, new orders (down from 30.1 to 25.5), production (down from 32.8 to 16.8), capacity utilization (down from 26.3 to 14.5), employment (down from 20.4 to 15.2) and hours worked (down from 23.3 to 13.4) slowed somewhat despite continuing to expand at healthy rates. Moving forward, manufacturing leaders in Texas were very positive about the next six months. The forward-looking measure jumped from 40.9 to 44.5, a level not seen in just over 13 years (December 2004). More than half of those completing the survey expected demand, production, shipments and hiring to increase over the coming months, with 43.6 percent planning to spend more on capital investments. One downside was a notable pickup in cost pressures, with elevated paces of growth for both raw material prices (down from 52.1 to 44.0) and wages and benefits (up from 44.2 to 56.9). On the latter, nearly 60 percent of the respondents anticipated that compensation costs would rise over the next six months, with the labor market continuing to tighten. The Bureau of Labor Statistics (BLS) reported that private manufacturing compensation rose 0.6 percent in the fourth quarter, slowing from the robust 1.0 percent gain seen in the third quarter. On a year-over-year basis, compensation in the sector grew 2.7 percent. Private manufacturing wages and salaries were up 0.7 percent in the fourth quarter, with benefits up 0.3 percent. Private sector manufacturing workers earned 2.5 percent more over the past 12 months in wages and salaries, with benefit costs up 3.0 percent year-over-year. BLS does not break out various benefit costs, including health insurance, in its quarterly releases. Overall, the employment cost index for private sector workers also increased by 0.6 percent in the fourth quarter, off slightly from a rise of 0.7 percent in the third quarter. Private sector wages and salaries and benefits increased by 0.6 percent and 0.5 percent in this report, respectively. Over the past 12 months, total compensation for private sector workers increased 2.6 percent, with wages and salaries and benefits up 2.8 percent and 2.4 percent, respectively. The Census Bureau reported that new factory orders rose by 1.7 percent in December, the same pace of growth experienced in November. In December, durable and nondurable goods orders were up 2.8 percent and 0.7 percent, respectively. For durable goods firms, much of the increase stemmed from sharply higher sales of defense and nondefense aircraft and parts, jumping 54.7 percent and 15.8 percent, respectively. It is important to note that aircraft orders can be highly volatile from month to month. Excluding transportation equipment, new orders of manufactured goods were up 0.7 percent in December. Overall, new factory orders—which struggled in 2015 and 2016—trended in the right direction in 2017. Indeed, sales of manufactured goods soared 8.4 percent since December 2016, or 6.6 percent with transportation equipment sales excluded. On the downside, core capital goods — or nondefense capital goods excluding aircraft — fell 0.6 percent in December. These can often be seen as a proxy for capital spending in the U.S. economy, and as such, the latest figures were a bit of a disappointment. With that said, much like the headline numbers, there was a healthy gain of 8.0 percent over the past 12 months. Looking specifically at durable goods activity in December, the data were mixed but higher on net. Demand was stronger for primary metals (up 1.8 percent), fabricated metal products (up 1.1 percent), machinery (up 0.4 percent) and motor vehicles and parts (up 0.4 percent). In contrast, there were fewer orders for furniture and related products (down 2.6 percent), electrical equipment and appliances (down 0.9 percent) and computers and electronic products (down 0.1 percent). The Institute for Supply Management (ISM) reported that manufacturing activity continued to expand solidly in January, even with some easing in several key measures in the latest survey. The ISM Manufacturing Purchasing Managers’ Index (PMI) edged down from 59.3 in December to 59.1 in January. (Note that these figures reflect a new seasonal adjustment update for all past data points.) New orders increased at their fastest pace in 13 years in December, but that expansion slowed a little in January, down from 67.4 to 65.4. Nonetheless, it was the eighth consecutive month that the sales measure exceeded 60, which would signify robust growth in demand overall. International growth helped fuel that demand, with exports (up from 57.6 to 59.8) expanding at their best pace since April 2011. Respondents in the sample comments tended to echo that finding, citing a brightened outlook and stronger U.S. and global sales growth. Production (down from 65.2 to 64.5) was also quite healthy despite a slight deceleration in that index, with that measure exceeding 60 since its June reading. On the hiring front, employment (down from 58.1 to 54.2) continued to expand at modest rates. Meanwhile, prices for raw materials (up from 68.3 to 72.7) remained highly elevated, with the measure at a level not seen since May 2011. This reflected a rebound in some commodity costs, even as overall pricing pressures continued to be largely under control, at least for now. In other news, inventories (up from 48.5 to 52.3) expanded quite modestly in January, ending three straight monthly contractions and consistent with the recent uptick in demand and output. The Bureau of Economic Analysis reported that personal spending was up 0.4 percent in December, extending the robust 0.8 percent gain seen in November. Americans have continued to increase their purchasing, making personal consumption expenditures one of the bright spots in the U.S. economy. Over the past 12 months, personal spending has risen by 4.6 percent, off just slightly from the 4.7 percent pace observed in the prior report. In December, durable goods spending increased by 0.7 percent, but nondurable goods were off by 0.2 percent. On a year-over-year basis, goods spending for durable and nondurable goods increased at very healthy rates, up 5.5 percent and 4.7 percent, respectively, since December 2016. Likewise, the savings rate fell to its lowest level since September 2005, down from 2.5 percent in November to 2.4 percent in December. The savings rate has trended lower since peaking at 4.1 percent in February. It is yet another illustration that Americans have accelerated their purchasing—something that helped increase holiday spending and provide a significant boost to real GDP growth in the fourth quarter. Meanwhile, personal incomes were also higher, up 0.4 percent. Over the past 12 months, personal incomes have risen 4.1 percent in December, up from 3.8 percent in November and the best reading in two years. In addition, manufacturing wages and salaries edged up from $841.3 billion in November to $842.1 billion in December. That translated into a 4.0 percent increase in manufacturing wages and salaries over the past 12 months, up from $809.4 billion in December 2016. In other news, the personal consumption expenditure (PCE) deflator inched up by 0.1 percent in December. Total prices for consumers were higher despite a 1.2 percent decline in energy goods and services costs. Indeed, core inflation—which excludes food and energy—increased by 0.2 percent in December. Overall, pricing pressures drifted slightly higher over the past couple of months but remained quite modest and largely under control, at least for now. After seeing pricing pressures accelerate strongly earlier in 2017—with the PCE deflator peaking at 2.2 percent year-over-year in February—inflation has pulled back since then. Since December 2016, the PCE deflator has risen by 1.7 percent, down from 1.8 percent in the previous report. Core PCE inflation was up 1.5 percent year-over-year in December, unchanged from November’s reading and well below the Fed’s goal of 2 percent. The Bureau of Labor Statistics reported that manufacturing labor productivity rebounded strongly in the fourth quarter, up 5.7 percent at the annual rate. The third quarter figures were pulled lower by hurricane-related weaknesses, with labor productivity and output down 4.9 percent and 1.6 percent, respectively. In contrast, output soared 7.3 percent in the fourth quarter, reflecting both a recovery from the hurricanes and stronger economic growth. Hours worked in the sector rose by 1.5 percent in the fourth quarter, with unit labor costs off by 3.7 percent. The sector breakdowns were also encouraging, with labor productivity for firms producing durable and nondurable goods up 6.7 percent and 4.5 percent, respectively. For the year, manufacturing labor productivity increased 0.7 percent, with output and unit labor costs up in 2017 by 1.7 percent and 0.9 percent, respectively. The annual figure for manufacturing labor productivity growth was slightly better than the average seen from 2013 to 2017, which was just 0.4 percent. Indeed, sluggish productivity growth continued to be one of the larger frustrations in the U.S. economy in the aftermath of the Great Recession. In comparison, the average growth rate for manufacturing labor productivity was 3.9 percent in the two prior economic recoveries, that is, the 1990-2000 and 2002-2008 time frames. Meanwhile, the nonfarm labor productivity data were discouraging, down 0.1 percent in the fourth quarter. While nonfarm output increased by a relatively healthy 3.2 percent, the productivity numbers were weighed down by a 3.3 percent increase in hours worked, with unit labor costs up 2.0 percent. Similar to the manufacturing data described above, nonfarm labor productivity has slowed considerably since the recession, averaging 0.7 percent per year from 2011 to 2017. That rate remained lower than the 2.7 percent annual growth-rate average seen from 2000 to 2007. The University of Michigan and Thomson Reuters reported that consumer confidence pulled back slightly for the third straight month from October’s robust reading (100.7), which was the highest point since January 2004. The Index of Consumer Sentiment edged down from 95.9 in December to 95.7 in January. This was better than the preliminary reading of 94.4 released earlier. Americans have benefited from rising stock prices, and they continue to be optimistic about income and job market growth. Yet, they also expect prices to pick up. In the January data, respondents felt more upbeat in their economic outlook for the coming months (up from 84.3 to 86.3), but the drop in the headline index stemmed from a reduced assessment of the current economic environment (down from 113.8 to 110.5). Overall, these data are consistent with 2.8 percent growth in real consumer spending in 2018.